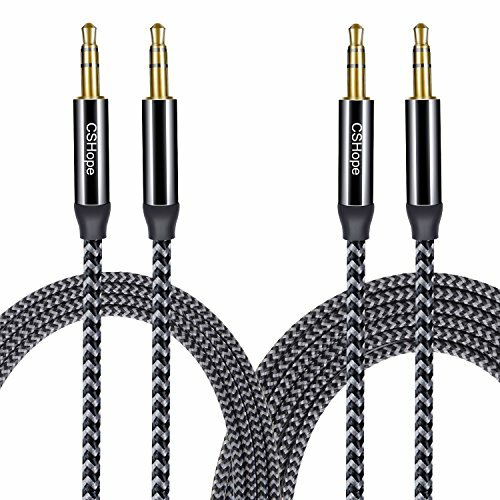 High compatibility, the stereo extension cable can work with all the devices with standard 3.5mm aux jack. 24k gold plated contacts with 3 stepped design ensure the purest stereo HiFi sound quality and reduce signal loss. Stranded copper and metal housing keep fast signal transfering and noise shielding, no hiss and static. Heavy-duty nylon braided cord lasts over 8000+ bend lifespan test, no worry about flexibility and durability. CSHope aux cable, professional stereo hifi sound, the best choice for your music. Compatible with all digital devices (mobile phones, headphones, tablets, laptops, in-car stereos, mp3 players, portable speakers and more) with standard 3.5mm aux port.